Don Norman’s The Design of Everyday Things is the bible for design thinking and technology. The author and cognitive scientist changed the way we think about design with his thesis about how technology is supposed to make our lives easier–and if it doesn’t, it’s just badly designed. These days Norman is busy creating a stealth startup, Palate Home, which hopes to use design to improve cooking. And as if being an entrepreneur isn’t hard enough, he’s also preparing for a MOOC (massive open online course) in November that already has 25,000 students signed up (seriously). In addition he’s releasing a revised edition of his classic book on November 5th. In a remarkable coincidence, November 5th is also the first day of our annual experience design conference RoadMap, which will cover the tech industry’s relationship with design. In the run up to RoadMap (and to his book launch) we interviewed Norman on everything from how he feels about Apple vs. Android, to when bad design becomes dangerous, to what he sees as the future of education. Rani Molla: What was the biggest challenge you faced in writing the new edition of The Design of Everyday Things? 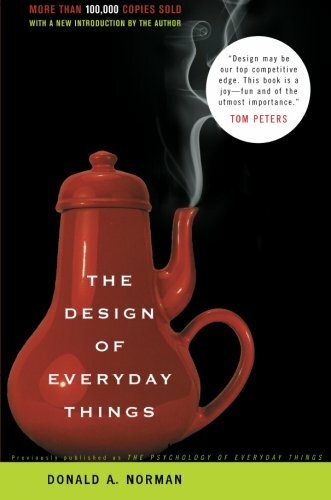 Don Norman: The Design of Everyday Things was published in 1988. Now, 25 years later, it’s amazing how the fundamental principles of design have not changed. That’s because people have not changed. However technology has changed a lot so the kinds of technologies to which these principles have to be applied are a lot different today than they were 25 years ago. Actually my real challenge in rewriting is, how can I describe things today so that 25 years from now it will still be correct? RM: In DOET you say: “Thanks to display screens, telephones are much easier to use than ever before, so my extensive criticisms of phones found in the earlier edition of this book have been removed.” What smartphone do you use and why? DN: Android. I think that the Android phones and Apple iOS phones are remarkably similar. There’s very little difference. The main difference is what religion you subscribe to: Do you subscribe to the religion of Apple (s aapl) or the religion of Google(s goog)? Actually, I think Android in many ways is a copy of the Apple iPhone. I don’t use the Apple phones because I don’t like the restrictive dictatorial policies Apple has instituted, so I went to Android because it’s more open. As a result of the openness, though, there’s a bit more chaos. Different apps work in different ways and are maybe not as reliable, but I still prefer the openness of Android. The truth is I use an iPad and I use an (iPod) Touch and I use an Android phone. But they’re all the same. RM: What about Windows phones? DN: I think Microsoft(s msft) has sort of been left out of this battle. People forget they exist. I think that the Windows 8 for phones is really a better system than either the iPhone or the Android. I’m very impressed with what Microsoft has done. It’ll take them a few tries to get it right. Now it’s on version 2 — and version 3 is always Microsoft’s hotspot. And I think the new Surface tablets and new phones — they did not copy Android, they did not copy iPhone. They started over again. They understand discoverability. They understand some of these design principles and they use them. RM: What’s happened with design since DOET was first published? DN: Design’s gotten a lot better and there’s a real understanding of what design is. It’s easier to use and easier to understand. But, at the same time, things are changing so rapidly that there are all sorts of new devices and new principles coming out that are horrible, just horrible. Sure I can critique them but it’s the same critiques I’ve been making and I’m tired of making the same critiques over and over again. I’ve actually stopped my critiques of usability and understandability because I’ve said it all. I want to talk about new opportunities and new experiences and the total package and trying to understand design as a system that changes the way we interact with the world — in medicine, in transportation, in everything — not just whether I can figure out if it’s a double tap or a triple tap. RM: Newer systems like iOS 7 are assuming that users have a fair amount of experience with the OS. Won’t these higher barriers to entry have consequences? DN: Well you can do a lot of simple things just by picking it up. It’s hard to discover, but the same principles apply because once you’ve learned them, they apply to everything. I think there will be a lot of learning but people will get used to it. Most of us today can pick up a new phone and figure it out pretty quickly. And I think there will be more standardization with time. In the early days of innovation, every company wants to be different and patent everything and prevent other companies from doing it the same way. This leads to a huge amount of confusion, but with time it’ll settle down to some common standards and I’m looking forward to that. Twitter patent for Loren Brichter’s pull-to-refresh gesture. Despite the patent, the gesture can be found on a number of devices and apps. RM: Speaking of standards, in the case of touchscreen phones, which are using more and more gestures, many of the gestures such as pull to refresh or pinch to zoom are patented. Doesn’t that make standardization sort of impossible? DN: Yes. I really detest patents. I think software patents ought to be eliminated. A patent is supposed to make your ideas public so other people can understand them and start trying to build on those ideas. That’s what the whole patent system is about: It’s a public document and it’s supposed to give limited protection for the patent owner to get back all the money that they spend inventing the patent. But today, that’s not what they’re used for. Today they’re badly written, they cover way too much territory, people sue you if they claim you violated the patent, and whether that’s true or false doesn’t matter. A startup company, for example, can’t afford to fight it. Even if the startup company is correct, it would cost too much money to fight it. I think patents and copyrights have stifled innovation and I’m firmly opposed to the way that we use today’s intellectual property laws. RM: Everyone remembers your door example — how being unable to open one is bad design. Can you give an example of modern tech that’s as frustrating as a badly designed door? DN: The modern automobile. The dashboards of modern automobiles are incomprehensible. Consumer Reports continually says ‘this is the worst car we’ve ever experienced!’ But guess what? Next month they’ll have another car that is even worse than the previous month’s worst car. More and more I read newspaper articles of someone who took a trip someplace and couldn’t figure out how to tune the radio or change the temperature. On top of that, these things are dangerous because as you drive and you want to make it warmer or change the radio station, you have to fiddle with menus and knobs and controls, and meanwhile your eyes are off the road. If your eyes are off the road for two seconds that’s enough to increase the chance of an accident. I think this is a disaster zone and the automobile companies have to wake up to this. RM: How should auto companies fix their vehicles? DN: Well they’re not well-designed. Each little element is designed by itself. You have to think of this as a system. You have to realize that people are in a complex environment: They’re driving at high speeds, they’re talking to passengers, they’re trying to calm down their children in the backseat. They’re trying to do a million different things and we have to completely redesign the interior of the automobile to make it safe. Someday cars will drive themselves but that’s going to be decades away. Meanwhile we’re going to kill people. RM: Experience is so subjective and yet it’s absolutely important for good design. How do you measure a good experience? DN: When we talk about experience, it’s fairly easy to measure a bad experience and it’s not that hard to measure a good experience. Look, one of the world’s experts on designing great experiences are Disney’s theme parks. That’s what they do. They are really excellent at making sure you have a good experience at their theme parks. Do they use metrics? Yeah they do, but they’re psychological metrics and subjective metrics. We can do it. Apple’s Newsstand in iOS 6 featured a skeuomorphic bookcase. For iOS 7 Apple lost the bookcase and opted for a more streamlined presentation. RM: Skeuomorphic design—making computer elements that look like their real-world counterparts seemingly would aid in good design: It’s discoverable, it provides a conceptual model, and yet major UI is moving away from skeuomorphic design because it also confines the possibilities to that of the real world. What’s your opinion? So, yeah, this big fuss about how stupid it is that Apple made a wooden bookcase that looks like a real bookcase. It is kind of stupid. Why don’t we just forget that and make something so that you can find the stuff you’re looking for, to make it simpler and easier. People seem to think this is some wonderful great trend, but that’s because the mighty religion of Apple has announced that Skeuomorphism is bad. RM: You write: “The phone, watch, and components of a computer will all form one unit,” which is largely happening. What’s your take on the many smart watches coming out or Google Glass? DN: That’s the way technology moves: Most brand-new ideas come about not because somebody studied something and did careful research but because they can do it. When technology makes things possible, people experiment with a million ways of doing things, most of which fail, but a couple of which are neat and useful. People have been trying to make smart watches for a long time. But today the new technology of inexpensive displays and inexpensive communication, means, oh yeah, when my phone rings and I want to know who’s calling… why not show it on the watch? If you think of the watch as a portable display, yeah why not. Google Glass is basically a smart watch but you put in on as eyeglasses. The people who did Google Glass are actually pretty intelligent because people have been wearing displays for 15 or 20 years. Google Glass is simply the most elegant of this trend. People who designed it tried very hard to restrict what it could be used for, putting it in the upper hand side of the visual field so it isn’t in the way. That also means you have to move your eyes up and to the right in order to read it, which is actually a friendly way to say you’re reading. Then they released it to developers and said, ‘We don’t really know what this is good for, why don’t you try a thousand different experiments to see where it’s useful and where it isn’t.’ I think that’s a pretty intelligent way of experimenting and seeing what it can be used for. Don Norman sporting Google Glass. RM: Will you use Google Glass? DN: Well I’ve tried them. I think yes. I’m not sure I want to wear them all the time, but I can see occasions where it’s wonderful. In my automobile, I have a Heads-Up Display, which is sort of like Google Glass. I look out as I’m driving and there sitting several feet in front of my car–well it looks like it’s sitting–is a visual display, a Heads-Up Display, that tells me how fast I’m going, tells me the speed limit and gives me navigation instructions. RM: You have a Nest thermostat and consider it imperfect but an improvement in the collaborative interaction between people and everyday things. What other devices do you have that are moving this way in design? DN: There’s all sorts of new technology that can make life easier but they tend not to be applied to the old-fashioned stuff. I’ve always been amused by the fact that when I go to a store and walk in the doors open automatically for me. When I have a hotel room I can just wave my hand over the newer doors and it unlocks. My automobile sees me coming and unlocks itself. But when it comes to my house I still have to fumble for my key. How come we haven’t applied these same technologies to the home yet? For example, we can use some of that wonderful tech to dramatically simplify and improve cooking. I believe that so much that I’ve actually co-founded a company that is trying to bring modern technology to the kitchen to make it easier to cook. I have a startup called Palate Home. What we want to do is make it so that you can cook perfect fish or vegetables or meat and it does it all for you. You don’t have to watch over it, you don’t have to wonder if you’ve overcooked it or undercooked it. It does it perfectly and it’s aware of time. It’s using good technology and modern food science. We are in the stage that all startups are in, which is seeking funding. (L to R:) Don Norman, IDEO CEO Tim Brown, and co-instructors Kritsian Simsarian and Chelsey Glasson standing in front of IDEO, which is part of a course interview for their MOOC. RM: What do you think about the design of MOOCs? DN: I’m very excited by the concept of MOOCs. Here’s why: I think American education is in trouble. It’s gotten far too expensive and we still rely on this age-old technology called ‘the lecture,’ which is the easiest way for somebody to teach but the worst way for someone to learn. We have to change from an emphasis on teaching to an emphasis on learning. MOOCs are a very exciting trend. This doesn’t mean it’s the way it’s going to be, but I think for the first time universities are taking seriously the fact that we should reconsider the way we educate our students. I predict that in 10 years MOOCs will have helped transform education. I have a feeling that today’s MOOCs will turn out to be not quite right, but it’s the start of a wonderful period of experimentation. Agreed on the “Tweet this” BS.. and also on the fact that this was one great interview. Looking forward to joining his MOOC class! Speaking of bad design, interrupting the reading flow with “Tweet this” opportunities ranks right there with modern auto dashboards. Can I just say that this is a great article? I think it’s laid-out well, the writing is clear and concise, and the questions and answers appear in an order that keeps the reader interested. Huh – I guess the writer, Miss Rani Molla, took something away from design thinker Don Norman for this article! I love and like android, the best OS in the world. > In my automobile, I have a Heads-Up Display, which is sort of like Google Glass. Did you ask what HUD is installed in his car? Or does it come with the brand of automobile he drives? The car is a 2013 BMW 3-series hybrid. It is BMW’s HUD — extremely well done. (Can’t say the same for the idrive controls). I wouldn’t call Don Norman a designer in the headline. He’s a researcher or strategist maybe. It’s like confusing a coach and a player in sports.